This article seeks to explain how, given Japan’s “nuclear allergy” following World War II, a small coastal town not far from Hiroshima volunteered to host a nuclear power plant in the early 1980s. Where standard explanations of conten- tious nuclear power siting decisions have focused on the regional power utilities and the central government, this paper instead examines the importance of historical change and civil society at a local level. Using a microhistorical approach based on interviews and archival materials, and framing our discussion with a popular Japanese television show known as Hatoko’s Sea, we illustrate the agency of municipal actors in the decision-making process. In this way, we highlight the significance of long-term economic transformations, demographic decline, and vertical social networks in local invitations to controversial facilities. 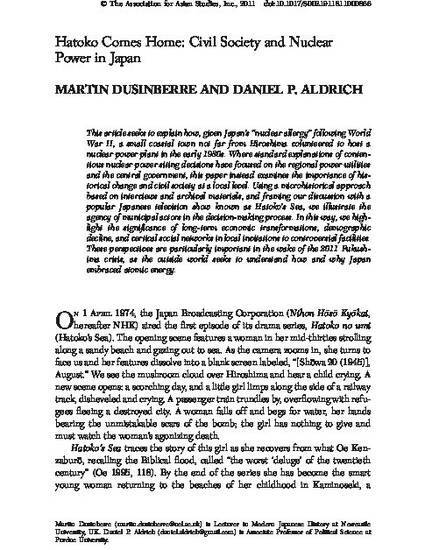 These perspectives are particularly important in the wake of the 2011 Fukushima crisis, as the outside world seeks to understand how and why Japan embraced atomic energy.